Nursing vs Elderly Care: Where do staffs in the care sector feel appreciated the most? MEDWING conducted a survey on current working conditions in the care sector. In this article MEDWING compared the statements of staff working in elderly care and nursing. In general, staff working in elderly care feels significantly more appreciated by patients than in nursing. In light of this MEDWING compared several departments and the results further supported this conclusion. Lastly, MEDWING contrasted the perceived appreciation by patients with the appreciation by employers and the society in general. Regardless of elderly care or nursing, staffs from the care sector feel significantly more appreciated by the patients than by the employers or the society. Besides general statements on job position, carrier type or departments participants of the MEDWING survey answered questions on current working conditions in the care sector. Over 2,700 staffs from the care sector participated in the survey from nurses, caregivers up to care managers, charge nurses or residential care managers. 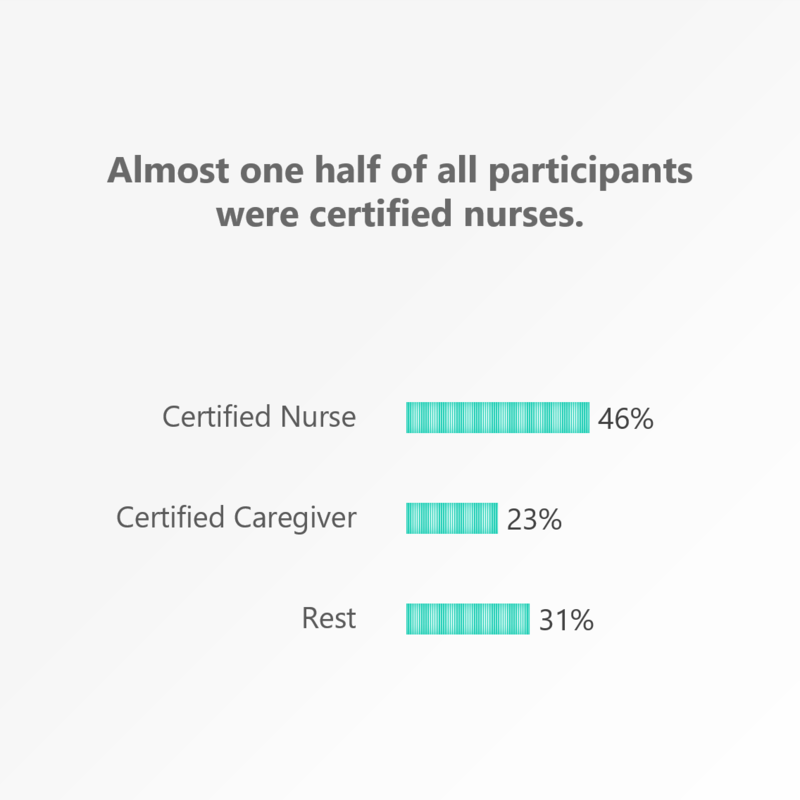 Almost one half of all participants are certified nurses and around one quarter are certified caregivers. In the first part of our survey we have already gotten to the conclusion that the patient ratio in elderly care lies above average. In this article we will take a closer look at the different areas of elderly care and nursing. But before conducting a deeper analysis of the different working conditions in nursing and elderly care one should take into account the different backgrounds of the participants. Here we have found some interesting results as well. With around 16% most certified nurses claim to work in an intensive care unit. 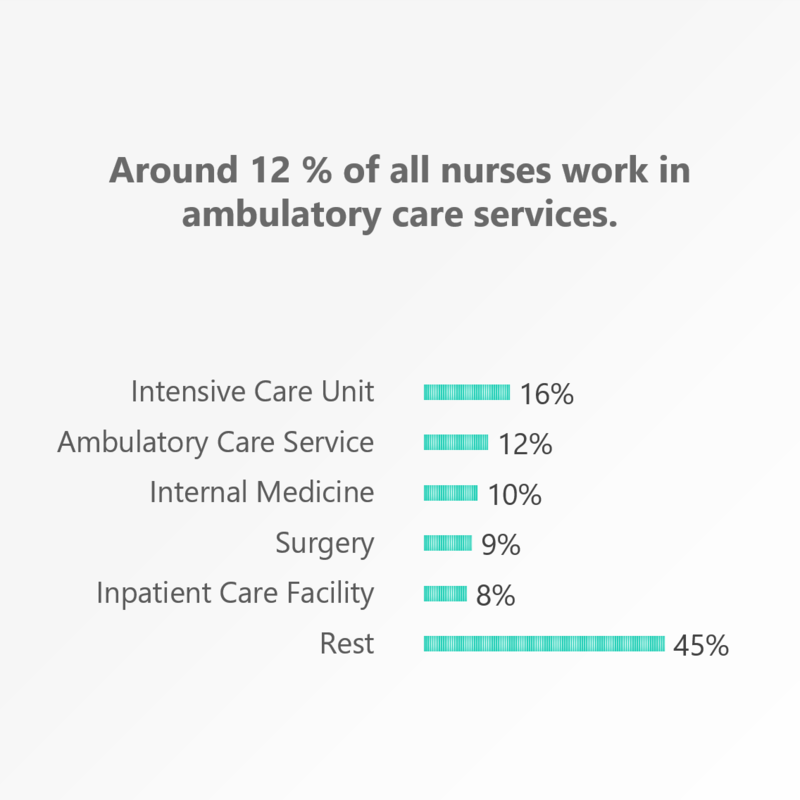 Around 12% are employed by an ambulatory care service and 8% work in inpatient care facilities. 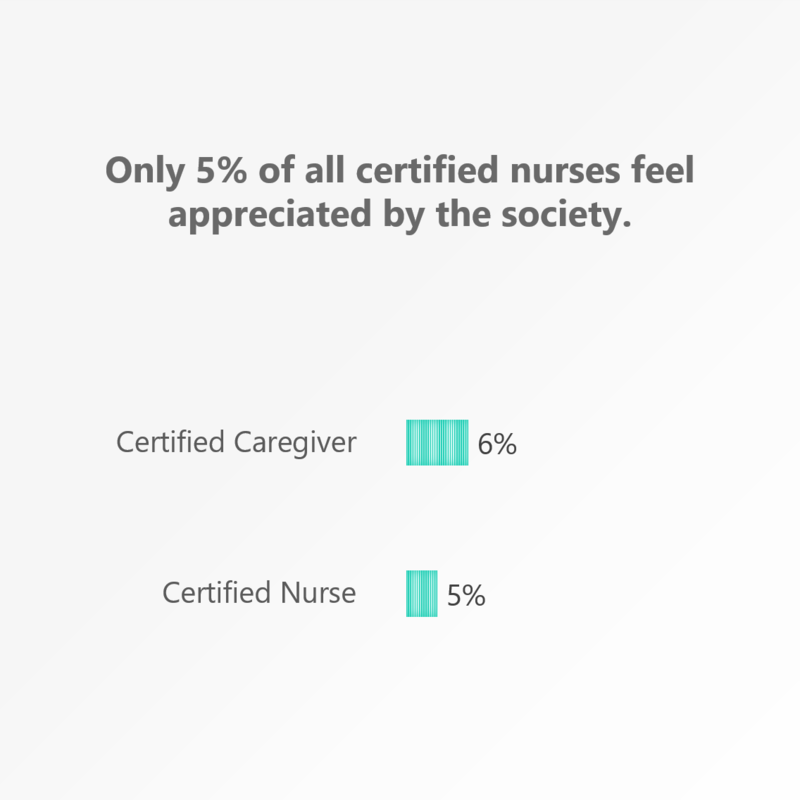 Almost one half of the certified nurses are employed by public carriers, followed by private carriers. The least are working for the church. However, the area of elderly looks very differently. Here around one half of all participants are employed by private carriers. 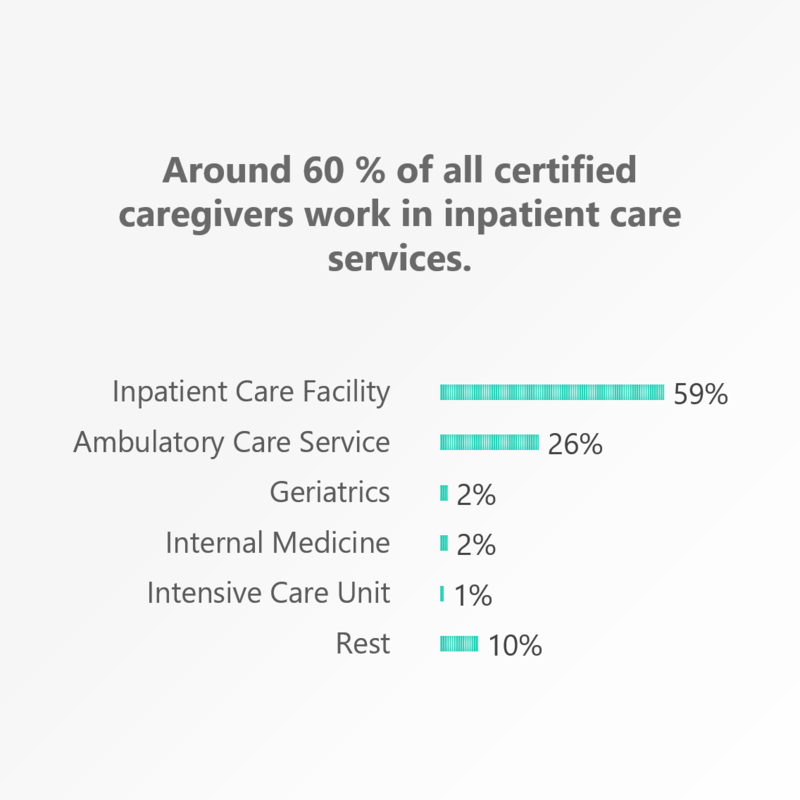 Additionally, more than a half of certified caregivers state to work in inpatient care units and one quarter is employed by ambulatory care services. Only 2% is working in geriatrics. Especially caregivers feel very appreciated by patients. 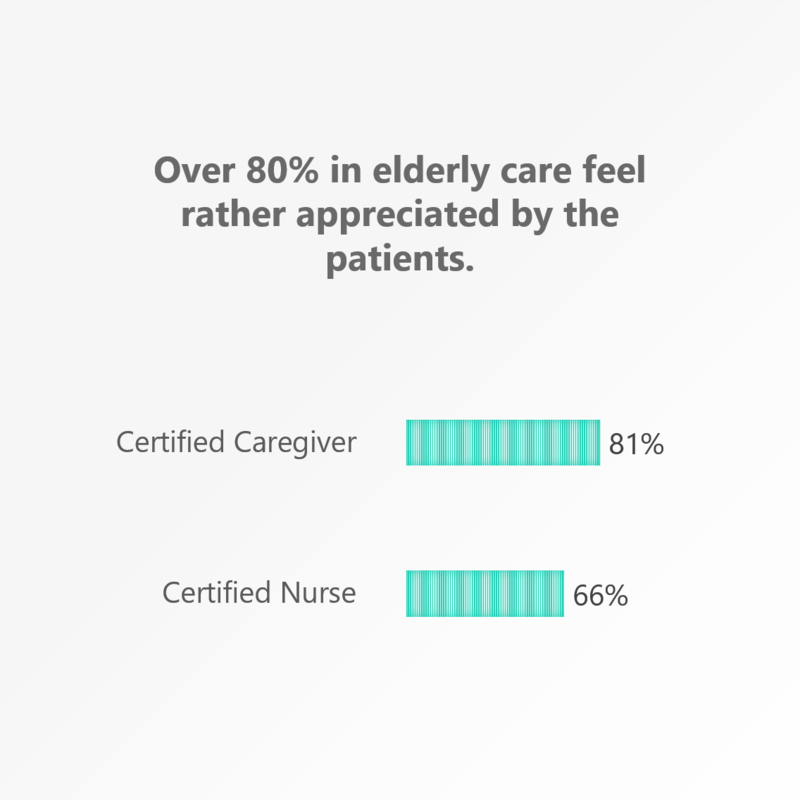 Around 81% of all certified caregivers state to feel appreciated by patients. In nursing instead, the patients' appreciation is perceived as less strong. Here, only 66% of the nurses feel appreciated by the patients. Could the perceived appreciation be related to the different characteristics of the patients? The patients in elderly care usually represent people from older generations who are living alone at home or in inpatient care facilities. If we then take a closer look at the different departments, the ambulatory care services as well as the inpatient care facilities stand out from the other departments. In both areas staff feels particularly appreciated by the patients. However, in ambulatory care services staff feels the most appreciated. Here around 85% of all staff claims to feel appreciated by the patients. A possible explanation for this result could be the fact that staffs working in ambulatory care services are rather able to build a personal relationship with the patients than in other departments because they visit them on al daily basis. On top of that, especially those patients who are living alone at home could feel particularly thankful for visitors. 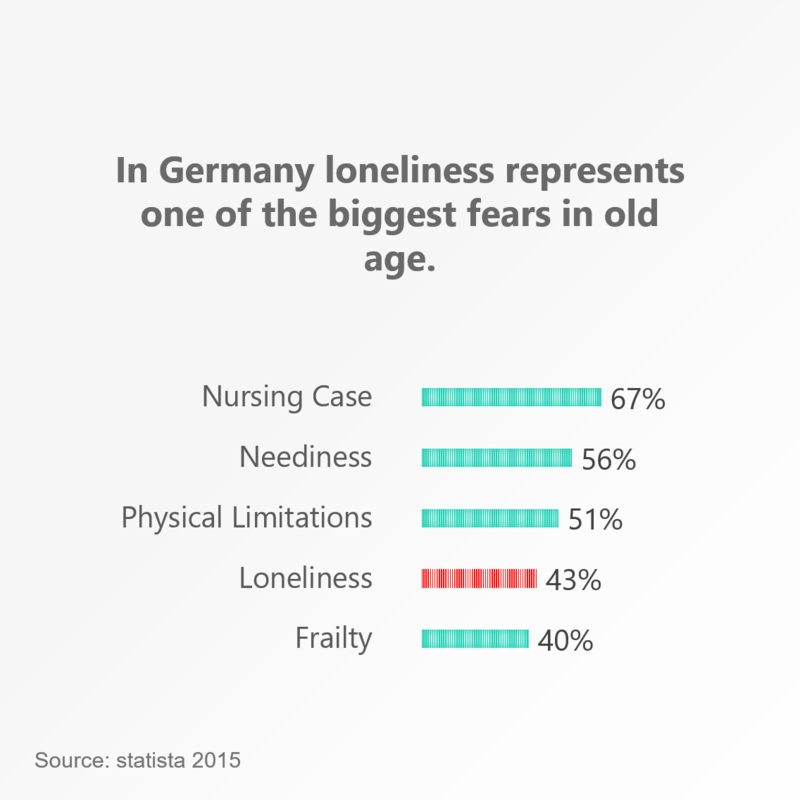 ﻿Besides an ageing population a constant growth of loneliness represents a severe problem of the German society as well. While the younger generation moves to agglomeration areas the elderly population grows more lonely; and especially lonely people are usually very thankful for any form of attention and care. In general, caregivers enjoy their work more than nurses. Here, almost one half of all caregivers states to fully enjoy the work which leads to the assumption that appreciation might at least play a small role with regards to the perceived fun at work. ﻿Unfortunately, the perceived appreciation by the society and employers turns out very differently. Both perform very badly not only in the are of nursing but also in elderly care. Only 5% of all nurses feel fully appreciated by the society and only 6% feel appreciated by their employers. The caregivers' perceived appreciation looks very similar. Such results should definitely trigger some thoughts on the current situation in healthcare. Especially, if we take into consideration that Germany is desperately looking for staff in the care sector. Besides low salaries, could understaffing in the care sector also be related to the low appreciation by society? ﻿In this context one should ask oneself: Who would enjoy an exhausting job that benefits society if the work is not even appreciated by the rest of the population, not to mention the employers?